Leviticus Cardio is developing an inherently robust, reliable, wireless system capable of providing the day-to-day power needs of today’s available implanted VAD’s, whilst eliminating the complications related to the driveline. The Company’s solution uses a unique proprietary technology - Coplanar Energy Transfer (CET) that can work with all available commercial VADs. Congestive Heart Failure (CHF) is a very common disease in the developed world, effecting around 23 million people worldwide. Of the six million people who suffer from CHF, in the US, 250,000 are in the most severe stages (NYHA Class IV) and suffer from a very poor quality of life and have a low chance of survival. The gold standard treatment solution for these patients is a heart transplant (an option for only a small minority of patients) or treatment with a Ventricular Assist Device (VAD), which is an implanted mechanical circulatory pump. According to recent NIH estimations, 50,000–100,000 patients in the U.S. are currently eligible for a VAD implant. Today, the power to supply a VAD is via a transcutaneous, driveline connecting to an external battery and controller. This extracorporeal driveline (13.5mm to 15mm diameter) exits in the area of the patient’s abdomen, providing a portal of entry for harmful pathogens. VAD recipients are therefore very vulnerable to device related Infections and repeated hospitalizations. Current strategies for preventing infections in VAD recipients focus on keeping the driveline exit site clean. Yet infection remains the single most important challenge to extended VAD use. Congestive Heart Failure (CHF) is a very common disease in the developed world, effecting around 23 million people worldwide. Of the six million people who suffer from CHF, in the US, 250,000 are in the most severe stages (NYHA Class IV) and suffer from a very poor quality of life and have a low chance of survival. The gold standard treatment solution for these patients is a heart transplant (an option for only a small minority of patients) or treatment with a Ventricular Assist Device (VAD), which is an implanted mechanical circulatory pump. Current strategies for preventing infections in VAD recipients focus on keeping the driveline exit site clean. Yet infection remains the single most important challenge to extended VAD use. Leviticus’ CET system enables a Fully Implantable VAD – the next inflection point for the VAD market. Leviticus Cardio’s solution uses a proprietary wireless technology called Coplanar Energy Transfer (CET) and it can work with all available commercial VADs. 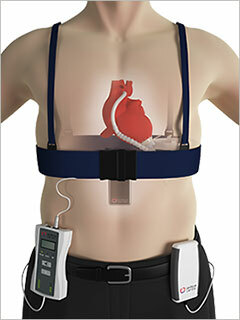 CET uses two coils — an implanted coil ring [product name], positioned next to the VAD device and an external coil, worn around the chest as a power transmission belt [product name]- so that the two coils are in the same plane. The transmitter coil encircles the receiver coil and inductively transfers electromagnetic power to it, from all directions.